Why do we snowboard? What’s the appeal? For me, it is something elemental that defies description. Trying to write about it is like trying to explain why I like my favorite bands. Snowboarding is not a fashion or an attitude; it is an awesome, personal experience that is better left unarticulated. 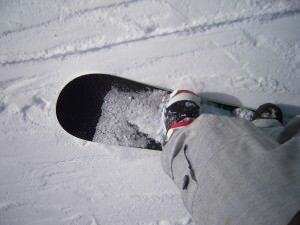 But, to try and put it into words, snowboarding just feels soooo good! It makes me a happier person. My own relationship with snowboarding started way back in 1990 at Stratton Mountain (yes, that’s right, this will be my twentieth season!). “Extreme” was the new catchphrase then and snowboarding was the ultimate concept, signifying youth, freedom, and a rebellion against establishment. Fast-forwarding to today we see that snowboarding has evolved rapidly, drawing from different technologies, fashions, and all sorts of sub cultures. Now, with everyone and their mother snowboarding and watching Shaun bring home the Olympic gold, it is clear that snowboarding has hit the mainstream. It is no longer an identity-forming image; it’s just something that people do every winter everywhere. Summers are spent dreaming of the cold wind on my face as I fly down some trail. And every fall I excitingly anticipate the release of all the new outerwear, hardgoods, and videos. I can’t name the #1 movie in theaters, but know the dates when all of this seasons snow flicks are released. To me, and everyone at OVR, snowboarding really is a way of life. We do what we do so we can live snowboarding, not just so we can live off it. Every day that we ride is a day that we can look back on and say that we went out and did what we absolutely love. And yes, I realize how cheesy this blog post sounds. This entry was posted in George's Blog. Bookmark the permalink.